Apartment Cameron has one bedroom on the ground floor of a small building consisting of four floors and it can accommodate two people comfortably. Additional camp bed, baby cot & high chair can be provided upon request. The apartment has 1 bedroom with 1 double bed & built-in wardrobe and 1 toilet/shower room. From the balcony equipped with table and chairs, you will have amazing sea view. The sea is only 200 metres away. The apartment is located in Protaras, only a seven minutes walk to famous Fig Tree Bay and all amenities, and ten minutes drive to Ayia Napa. There is 5 miles of promenade for holiday makers nearby. Apartment Cameron will make your stay an unforgettable experience. 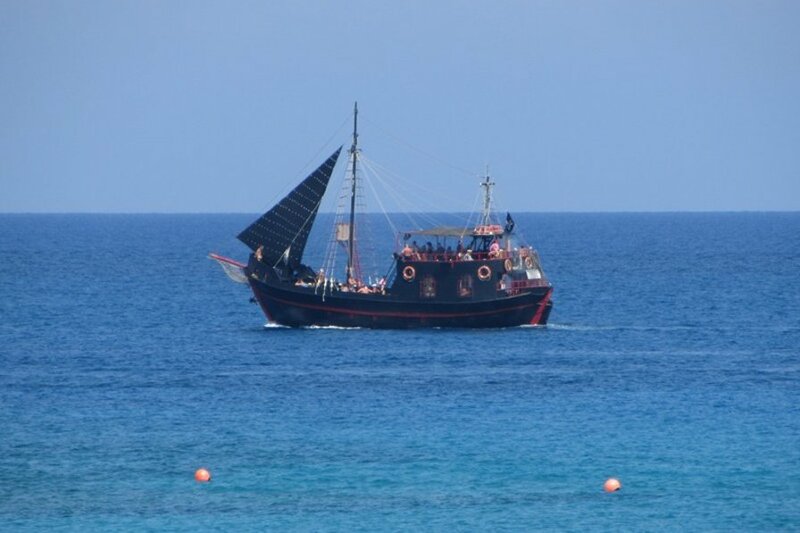 The famous Fig Tree Bay is just a short walk away, and there are a few smaller beaches nearby as well. Excellent bars and restaurants are within walking distance too. The complex boasts tennis court, 2 outdoor pools, and baby pool that can be used free of charge. One bedroom apartment with a comfortable double bed with bedside cabinets, dining table with 4 chairs & breakfast bar with 2 stools, balcony with sea view, and outdoor furniture. The apartment is fully furnished and equipped with all modern appliances such as TV, DVD player, microwave, oven, dishwasher, full size refrigerator, washing machine, toaster, kettle, and all necessary kitchenware. There are 2 communal pools, and a children's pool with sun loungers for use by our quests free of charge. Welcome Hamper upon arrival free of charge includes bottle of Wine, Water, Juice, Tea (10 sachets), Coffee (10 sachets), Sugar (10 sachets), Sweets. House keeping and additional services are available on request. The apartment is located in one of the most attractive resorts of Cyprus Protaras. A couple of minutes walk you will find bars, excellent taverns and restaurants, supermarkets, bank, kiosks and car hire rental offices. Larnaca airport is about 40 minutes drive. The apartment ideally situated and equipped offers pure relaxation and family-orientated holiday on one of the most attractive Cyprus beaches with Boat trips, Scuba diving, Fishing, swimming and diving, and all kind of Water sports.